Xiaomi Mi A2 has currently been launched in worldwide. This smartphone is being seen as a better option for the Redmi Note 5 Pro. Xiaomi’s primary focus is to build cheap cost and budget smartphones. Therefore, the company brings low-end smartphones to users in the market. Xiaomi’s Redmi Note 5 Pro is being widely loved in the world. However, Xiaomi Mi A2 can be better than this smartphone in these 5 cases. Let's know about these 5 features. Most of Xiaomi smartphones are marketed with MIUI user interface. However, this smartphone has been launched with the Android One based Android OSO 8.1 operating system. 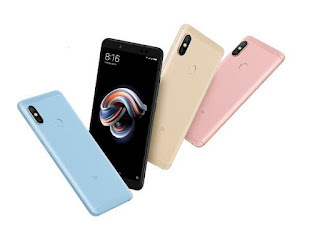 In the MIUI user interface, a customized skin of M is given, while the Android One interface is zero Bluetooth Ware, equipped with excellent specifications and security updates that are available every month. Xiaomi Mi A2 has 12 megapixels and 20 megapixel dual front camera. While Redmi Note 5 Pro has a 12 megapixel and 5 megapixel dual rear camera. Both sensors come with f / 1.75 aperture, which can take great pictures even in low light. Both phones have Artificial Intelligence based camera features. The special thing of Xiaomi Mi A2 is that it can record video in 4K resolution. Talking about Redmi Note 5 Pro processor, Snapdragon 636 processor has been given in it. However, Xiaomi Mi A2 has a better 660 SOC processor whose frequency is 2.2 GHz. Talking about Xiaomi Mi A2 storage, it has 128 GB of internal storage. Whereas, 64 GB internal storage is provided in the Redmi Note 5 Pro. On the other hand, in the Redmi Note 5 Pro, a hybrid memory slot has been given, which allows the phone's storage to be enhanced through a micro SD card. Xiaomi Mi A2 does not have any option to increase memory. Xiaomi Mi A2 comes with USB Type-C charging support, while the Micromax USB 2.0 port charging jack has been given in the Redmi Note 5 Pro. Xiaomi Mi A2 supports Quick Charge 4.0. The Redmi Note 5 Pro also supports Quick Charge 2.0.